We are so in love with this story, but we’re warning you now: You may need some tissues, because it’ll give you all the feels. After playing over 300 games together, a man and woman who play Words With Friends recently met IRL. 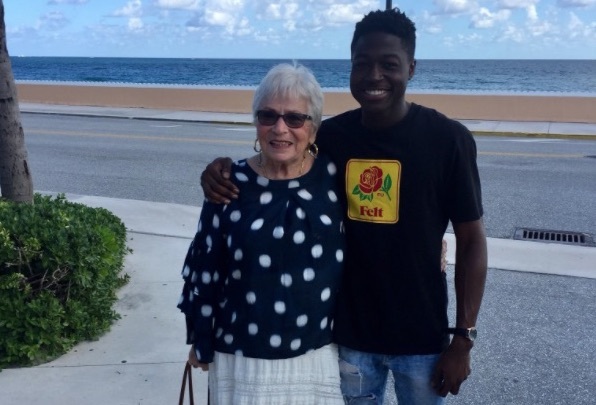 According to Metro, 22-year-old Spencer and 86-year-old Roz met for the first time on Friday, December 1st. He flew down to Florida all the way from New York! Of course, Words With Friends is the super popular word game that’s a lot like Scrabble (but not actually affiliated with Scrabble). People get very addicted to it very quickly. In fact, it’s so popular that Words With Friends 2 recently came out too. You can play both games online with actual friends of yours, or with strangers. And that’s exactly how Spencer and Roz “met” over a year ago. Since then, they’ve managed to play more than 300 games together. However, the two live several states apart; Roz lives in a retirement community in Florida, while Spencer lives in Harlem up in New York. So how did their in-person meeting come about? It was arranged by a pastor in NYC, Rev. Dr. Amy Butler, aka Pastor Amy. Naturally, Spencer tweeted about meeting Roz IRL. In one of his posts, he said that Roz is “a good friend of mine.” Aww. Naturally, the Twitterverse is loving it. Look at those smiles, this is everything good about social media and online gaming wrapped up in four pictures and a tweet. People are feeling all the feels. It’s always nice to read a positive feel-good story. And if you’re curious about their Words With Friends scores, Spencer tweeted their stats. And, naturally, he also thanked Pastor Amy. Pastor Amy also tweeted about Spencer and Roz meeting. Words With Friends even tweeted about it! We love how Spencer and Roz connected, and that they got to meet in person. We hope they will continue their friendship and their Words With Friends games!